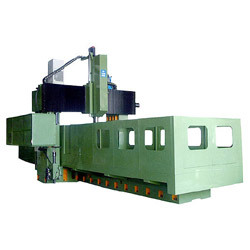 It fits in working big workpieces of molding drilling field and fits in column NC drilling. 1. Double column machine: CDM-2000SD. 2. Machine weight: 47000. 3. Required floor space: 11200 x 5100 x 4720. 4. Max. load bearable by table: 12800. 5. Power: 55KVA.